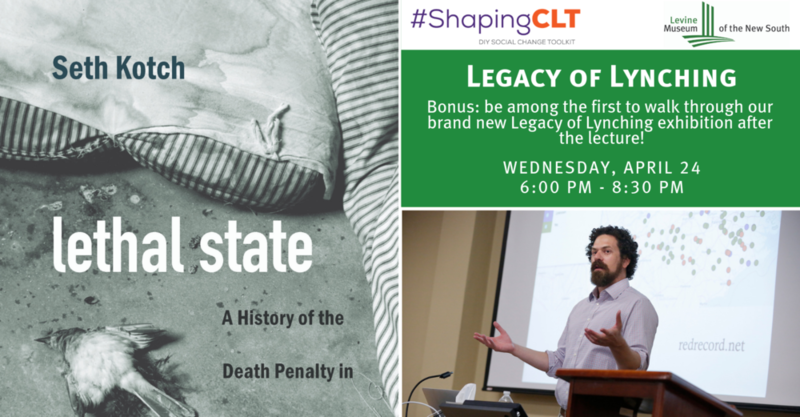 This month's #ShapingCLT will feature a discussion and book talk with historian and UNC Professor, Dr. Seth Kotch, author of "Lethal State: A History of the Death Penalty in North Carolina." On April 24th, join us as we explore the connection between the death penalty in North Carolina and its relationship to lynching. Tickets are $10, which includes program, cash bar, and light bites prepared by a local chef. A do-it-yourself social change toolkit, #ShapingCLT is a solutions-oriented variety show aimed at vanquishing apathy. The examination of Charlotte’s future will move participants beyond conversation towards civic action. This guest-curated program will bring together thought leaders in our community representing a variety of perspectives on trending issues. Presented by Bank of America. All programs are hosted by Davita Galloway of Dupp&Swat. Each program is $10 for non-members (25% discount for members) and includes program, light bites, and a cash bar. Space is limited, reservations required. #ShapingCLT takes place one Wednesday per month from 6:00p.m. to 8:30 p.m. at Levine Museum of the New South.